3D Youtube Downloader, as the name suggests, is basically a utility that helps download the YouTube media (videos/audios) including the 3D videos. 3D Youtube Downloader is capable of searching and downloading different types of media from YouTube, Dailymotion, Vimeo, LiveLeak and many other sites for non-browser and/or offline playback (even subtitles and 3D videos from YouTube and Dailymotion can be downloaded). Depending on current work mode 3DYD automatically selects apposite file to download, or gives you a chance to do this manually. The YouTube adaptive streams & the YouTube and Dailymotion feeds (playlists, channels, etc.) are supported. Fast download works with multipart downloads and HTTP compression, as well as proxy support to help bypass network limitations. Multiple criteria including size, detail, ratings, and so on are included in the search tool. 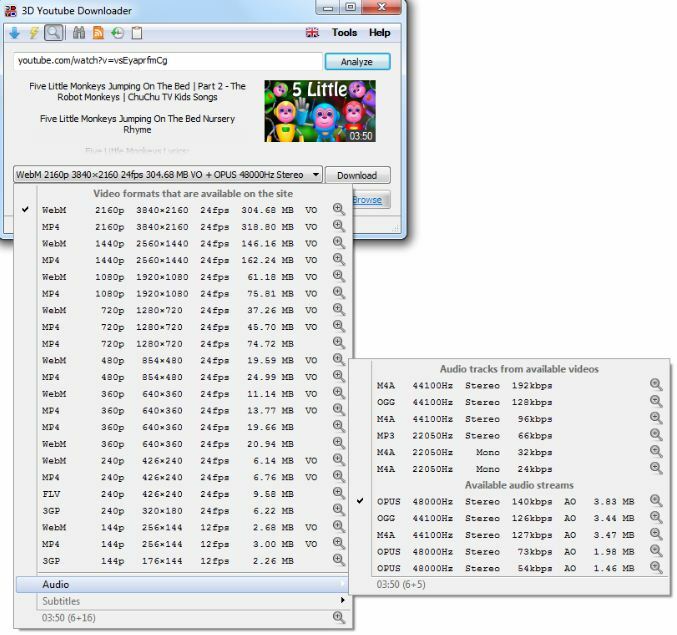 The simple but powerful interface offers options for different types of users including advanced for detailed view of available formats and quality levels, as well as a conversion (aka transcoding) mode for moving files to a different format altogether. This great program supports a variety of media file quality and formats including MP4, WebM, FLV (video) and M4A, MP3, OGG (audio), as well as conversion to AAC, WMA, SPX, and many more. The application can view YouTube RSS aggregators; therefore, you can see and download the latest in a series. To use the portable version, download the installer and launch. Select ‘Portable Installation’, and choose the destination folder of your choice. Launch 3dyd64.exe (for the 64 bit version). The program writes settings to the application folder, and the good news is that the ‘stealth’ works. You could Search on Youtube, Use URL from site feed, Use one of recent URLs, or Use URL from the clipboard by clicking the respective button. The Convert Mode button is available, too. Click Browse to choose your destination folder, and hit Download. Wait until your download is done (the status may be checked from the bottom box of the 3DYD window). You will be surprised at how fast it is! I am happy with 3DYD. True that it’s a bit clumsy to run multiple instances of 3DYD for concurrent downloads, and you cannot download the protected contents either, but 3DYD is a free portable software that is fast, lets you choose the format you want (i.e., full control over what you are downloading), and gets the job done. I have tested 3DYD in Windows 7 Professional 64 bit. Do you like this article? Share it with your friends & families! Wanna say something? Let us know in the comments!